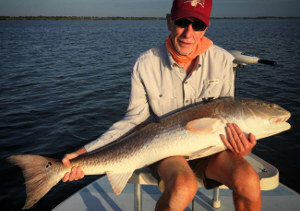 Down to the last little month or so of summer and the bite is still red hot in the Mosquito Lagoon and near New Smyrna Beach and Ponce Inlet. 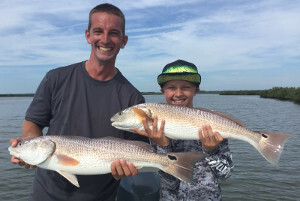 We’re fishing schools of redfish every morning in Mosquito Lagoon and wrapping things up catching bunches of spotted sea trout. Lots of snook and tarpon in the deeper waters around New Smyrna. Fishing is not gonna slow down for the next 6 weeks, then we’ll start to see baitfish thinning out and the fall transition taking place. I’ve got 12 days left open for August and about the same for September. Get in the great catching while you can!!! 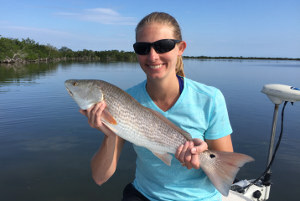 Fishing for Mosquito Lagoon redfish have been excellent the last couple weeks. Lower water levels have the fish schooled up big time during the morning. Numerous groups of 75-150 grouped up fish in the 5-10lb range. 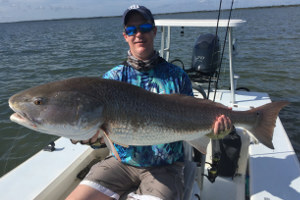 GIANT bull reds have also been schooled up in both lagoons for their annual spawn with fish in the 20-40lb range coming to the boat each day last week. 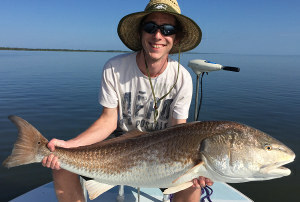 Summer and early fall is prime time for catching these trophy size redfish. 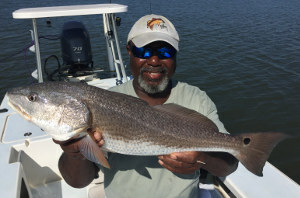 Live bait has been the ticket with mullet, pinfish, pigfish all catching plenty. Soft plastics, plugs and spoons have worked when throwing lures. 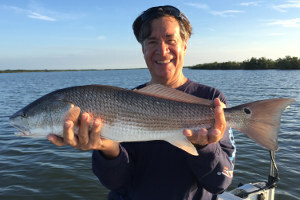 The Speckled Trout bite in Mosquito Lagoon is still going strong. 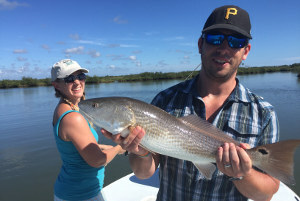 It’s also picked up well in New Smyrna Beach around oysters, creek shorelines, and docks. Live bait is producing 15-20 trout per day; many are smaller keeper size fish with some big ones upwards of 7-8 pounds too. 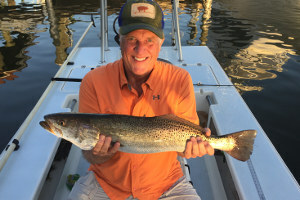 Fishing for speckled trout will remain like this until the cold fronts start to roll through and baitfish supplies run out in late September. 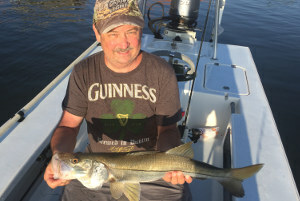 Fishing for Snook in New Smyrna Beach and Ponce Inlet has been good around the docks, bridges and shorelines. However, it’s going to get even better next month when cold fronts start to get going and baitfish begin their fall migration. 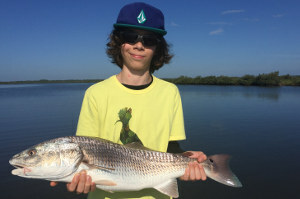 Where snook are hanging out now makes for tougher fishing with heavy gear and lots of lost fish or break-offs but we’re getting a fair number of bites each time we fish them. Snook season reopens on September 1st, so for the next few weeks it’s still catch and release. Lots of juvenile tarpon in the 10-30 pound range were around last month, then numbers thinned out again last week which tends to be normal. 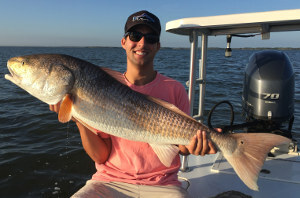 Should see a big increase in numbers of bigger adult fish in the 50-100 pound range this month and September as they start to work their way south for the fall.